Lazar has always been focused on eco-conscious furniture--however this was recently brought to the forefront with the launch of their Earth Designs product line. Recycled and recyclable materials are used throughout the manufacturing process, including the frame, cushions, seating system, packaging and other materials. 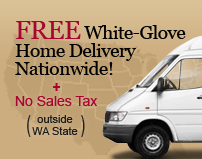 Non-toxic glue and water-based stains are also used. The sleepers within the Earth Designs line have also been drastically upgraded--and re-launched as the Every Night Sleepers. 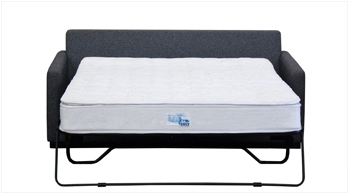 Each Every Night Sleeper includes a larger, better quality mattress than competitors offer in the market place--with an 8.5" thick pillow-top bed measuring 76" long as opposed to the 72" industry standard. 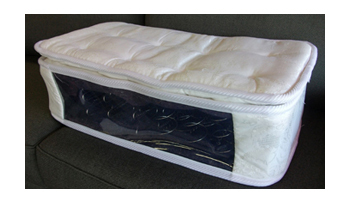 The Every Night Sleeper mattress recently passed the Cornell Evaluation for a 10 year mattress standard--a first in the sleeper sofa industry! Lazar offers eco-friendly advancements across their entire product base. However, the company recently launched an "Earth Designs" line which brings the environmentally-conscious factor to the forefront. Lazar currently offers four sleeper sofa styles (in several sizes and configurations) in the Earth Designs line. 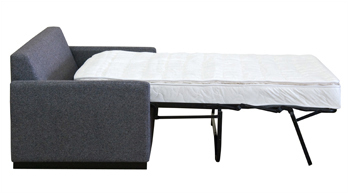 In addition to the "precycling" efforts listed below, these styles, coined the "Every Night Sleepers", include upgraded "Cozy" mattresses and mechanisms to give any customer a slew of reasons to check out these great new sofa beds. 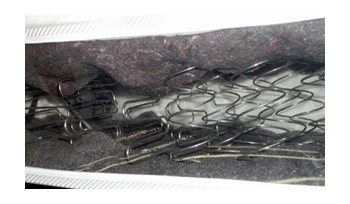 Mattresses are longer than other sleepers, at 76" instead of 72"
Mattresses are thicker than other sleepers, at 8.5" instead of 5" - 6"
Precycling refers to the method of reducing waste by avoiding the introduction of harmful materials or materials which cannot be recycled. The table below lists several components included in the Earth Design line in which Lazar utilizes precycling efforts. Packaging made from 100% recyclable plastics, cardboards, and wrapping; 100% recycled plastics; Water-based non-toxic glue. Other materials made from 100% recyclable post-consumer tack strips, padding, staples, and legs; 100% water-based stains and lowest V.O.C. content available sealers and lacquers.